A Roman church inside the walls of the Zerzevan Castle. During my visit to Diyarbakır last week, I had very little time to tour the entire city due to heavy rain, and I was not able to visit the city's most important archaeological find, Zerzevan Castle. Yet, just a few hours before my flight back to Istanbul, my kind hosts at the Diyarbakır Provincial Culture and Tourism Directorate and the head of the excavations invited me to take a quick tour of the site that is a doorway through time to Roman rule in the region. Early in the morning, we headed to Zerzevan Castle, located 13 kilometers from central Çınar in the Demirölçek neighborhood. I was accompanied by Cemil Alp and Mehmet Can from the Culture and Tourism Directorate and the head of the Zerzevan excavations, associate professor Aytaç Coşkun of Dicle University. Situated on the hilltop on an area of 6 hectares, Zerzevan Castle was used as a military settlement in the Roman era when Diyarbakır was the eastern border of the Roman Empire. The castle was perhaps the most strategically significant Roman military garrison. The cisterns of the castle could store huge reserves of clean water. Although the excavations only began in 2014, archaeologists have restored the early settlement and determined how the castle was used by thousands of Roman soldiers and servants. As we started the tour, Coşkun said there was another castle dating back to the Assyrians. When Romans captured the region after the 3rd century B.C. they built the enormous castle and turned the ancient ruins into one of the largest strongholds of the empire. While wandering around the ruins, it's surprising to find how well preserved the site is. Coşkun said that after Muslim armies took the city from the Romans, they left the castle as it was, and it eventually became a ghost town. The site was buried at least 7-meters underground, keeping 1,500 years of history intact. Surrounded by 15-meter-high and 1,200-meter-long walls, the site has a 21-meter-high watchtower and church, administration building, residences, grain and arms stores, a subterranean temple, sanctuaries, sepulchers, water channels and 54 cisterns and rock-carved tombs. The best-preserved Roman military headquarters ever discovered, Zerzevan Castle and the excavation site offer insight into the lives of the Roman legion and war tactics and daily civilian life. This exciting site feels like there is much more to see buried underground, waiting to be unearthed. 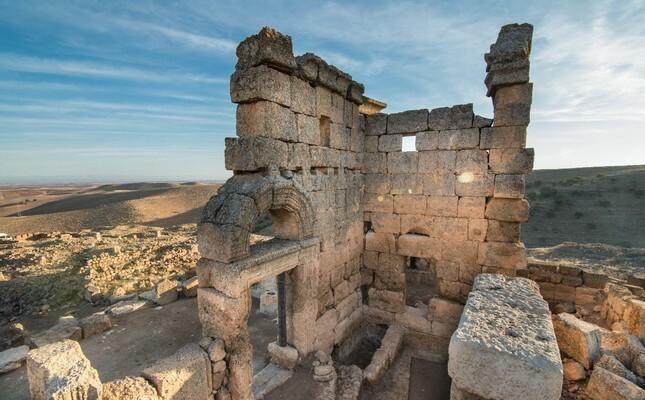 Çoşkun said they need at least 50 more years to uncover all the remains of this ancient Roman structure and that the Zerzevan archaeological site has been named as an excavation that will be allowed to continue throughout the year with the permission of the Ministry of Culture and Tourism. What excites archaeologists at Zerzevan most is the Mithras Temple. Carved inside rock to the north of the castle, the temple is 7 meters in length and 2.5 meters in height. This temple is unique because it is the only and last Mithras Temple found on the eastern border of the Roman Empire and believed to be the first Mithras Temple built by the Romans. Mithraism is the worship of Mithra, the Iranian god of the sun, justice, contracts and war. When the Roman Empire extended its borders east, they adopted this Iranian god in 2 B.C, honored as the patron of loyalty to the emperor. After the acceptance of Christianity by Emperor Constantine in the early 4th century, Mithraism rapidly declined and was eventually banned. Mithraism was very common among soldiers, tradesmen and aristocrats. Archaeologists and historians are familiar with the religion, but the rituals, which were only open to men, are still a mystery, as they were confidential, and nonbelievers were not allowed in the temple. A new member welcomed into the cult had to go through "12 torments." Inside the temple, one can feel a chilling yet intriguing energy that beckons you closer. Symbols describing Mithras are still visible to the naked eye. The temple's altar has three sections where idols of Mithras were put during rituals. The temple also features hooks where a bull was hung before it was sacrificed to the god. A pool under the altar collects bull blood, which believers were known to drink. As I examined the temple, it is hard to believe that this place is the birthplace of secret societies. Although it is small, the secrecy and sense of brotherhood of Mithraism inspired many secret organizations and brotherhoods that would emerge centuries later and throughout history. The discovery of the Mithras Temple at the Zerzevan archaeological site created national and international headlines in archaeological circles, turning Zerzevan into an attraction for those curious about this ancient religion. This find is so important that "ICORP-On The Road," a documentary series of the International Council on Monuments and Sites changed their route after shooting in Katmandu and filmed this Mithras Temple, which has been so inspirational that the third season of Morgan Freeman's "The Story of God" on the National Geographic Channel will feature Zerzevan Castle and the Mithras Temple. Last year, the World Federation of Travel Journalists and Writers (FIJET), founded by French and Belgian travel journalists' and writers associations, presented their prestigious Golden Apple to Diyarbakır for its historic tourist values, the hospitality of its locals and efforts by the private sector and NGOs to increase tourist activities in the city, but mostly due to the discovery of the Mithras Temple. Last year, the Zerzevan archaeological site welcomed over 350,000 visitors, and this year almost a million visitors are expected.